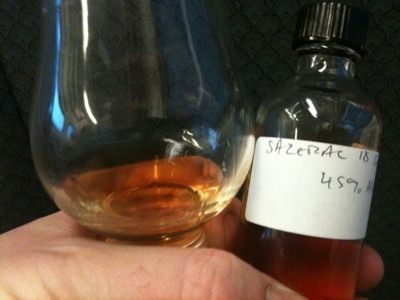 Sazerac 18 is the mature rye in the Buffalo Trace Antique Collection and is, by many accounts, a lot of people's favorite. I received a sample from Tim Read, the incredibly thoughtful whisky blogger of Scotch & Ice Cream, LAWS member, and a man who was one of the original inspirations for me to blog in the first place. Encountering him on the Internet was a thrill. Being able to sample his bottles of the BTAC is a big thrill too. I had skipped the annual BTAC frenzy for years, with a superior "I'm not a joiner. I'm not going to jump through hoops just to get some bourbon or rye" kind of attitude. My recent tastings showed me that the frenzy was justified and I have been missing out on some of the finest whiskies that America has to offer. But the fact remains, these are wickedly hard to get even in the limited autumn season they are available. The 2011 Sazerac 18's composition is described on the excellent SF whisky blog "The Casks" as follows: "Created from a mashbill of Minnesota rye, Kentucky corn, and North Dakota malted barley, this was aged for, you guessed it, 18 years and bottled from a selection of 28 barrels." Just 28 barrels. No wonder these are so hard to get. I hope they start putting more away for the decades to come. 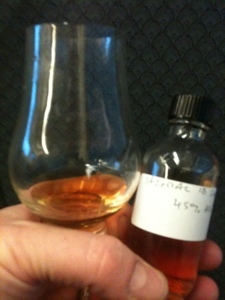 Nose: Initially acetone, cherry, leather and peach - bourbon-like. With 15 minutes or so of air floral and candy notes emerge mysteriously and wonderfully: roses, orange blossom, candy apples (the red glazed kind) and cotton candy join the cherry peach. The apple note have a nutmeg allspice aspect that is reminiscent of compote or baked fruit desserts. Ultimately floral and fruit sweet meets potent baking spices. Nice. It's an extraordinary nose by any standard. Entry is initially soft. Sweet citrus and then dry strawberry wine with a potent floral aspect mark the opening. Certain sips are marked by a strawberry candy note like a Jolly Rancher or strawberry-orange turkish delight - but with much less sugar on the palate than this signature implies. The mid-palate expands with spicy cinnamon heat, cardamom pods, sweet lotus, baked spiced apple, or mulled cider, leather and oak. It's a rich and full palate - but the mouth feel is light and fairly dry, and the density of flavor is as well. Rich, but not intense. The turn to the finish sees the sweet notes fade and oak warm an fill the void. The rye bitter herbal finish waxes over that and you end up left with a bittersweet vegetal note like having eaten lotus root with cherry glaze and bitter almond oil. There is a black tea like tannin aspect at the finish as well. Gentle, rich, spiced yet soft. This is another regal august flavor profile. The floral and strawberry aspects are particularly beguiling for me, although after the Handy this barely reads as rye. Blind, I might guess a high rye bourbon. After the Handy I miss the pow and density of the flavor. However, truth be told this is incredibly lovely hooch no matter whether it plainly appears to be rye or not. This is a common paradox with older ryes. Smoother, more regal, but less herbal flavor and less spicy heat. Sazerac 18 avoids the most common pitfall: an overly strong oak influence. I don't know the factors that led to this being bottled at 45%. Perhaps after the angel's share this was what was left? If not, my hope is that they skip dilution in the future. With a touch more intensity this might be one of the greatest spirits ever. Actually, even as is it is one of them. I figured limited supply was a motivation. Thanks for linking to a definitive story, Jordan. It makes plenty of sense. As it is, it's just a tiny fly in the ointment. As you were saying in your comments after the Handy post, there's plenty of reason to hope for the future since the younger stuff is so good. Dalmore 15 is a deeply sherried delight.